The Elephant Hawk-Moth is a species of common large pink and olive green moth that is widely spread throughout Europe. 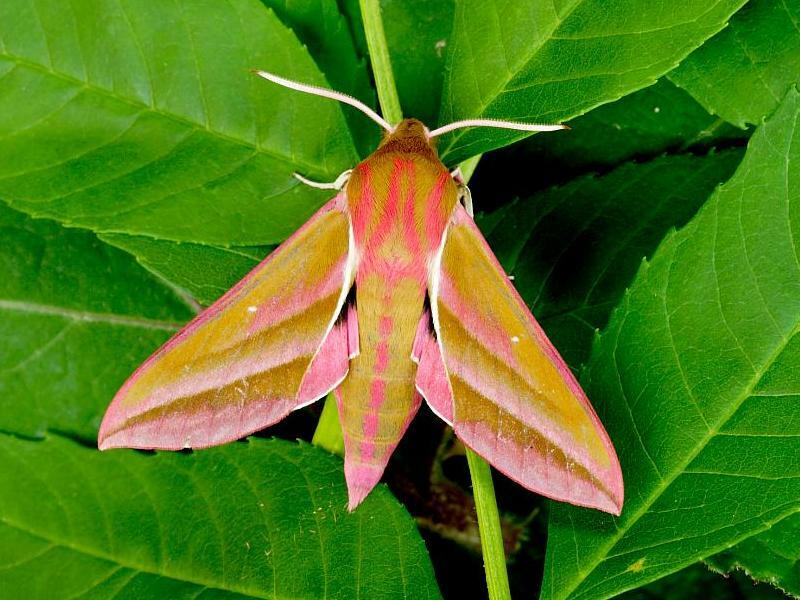 It is one of the brightest moths, and hence, is also popular in the pet trade. The larvae (caterpillars) of these moths are often found roaming in the gardens, feeding on leaves and flowers, during late summer. 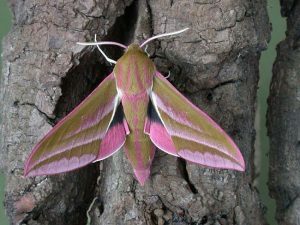 The moth gets its name from the elongated shape of its snout during the larval stage, which resembles the trunk of an elephant. Body: Medium size body with a wingspan 62-72 mm. The head and thorax regions are segmented and are more slender than the rest of its body. Wing Color: The wings have patterns in bright pink and olive green while the body has bright pink lines and dots on an olive green base. Feet: The legs are thin and pure white. Eyes: The eyes of the moths are anti-reflective because of nanoscale protrusions. This moth is most commonly found in England, Wales, Scotland, and Ireland and other parts of central Europe. The concentration becomes thinner towards the northern regions. However, their range also extends throughout Asia, up to Japan. 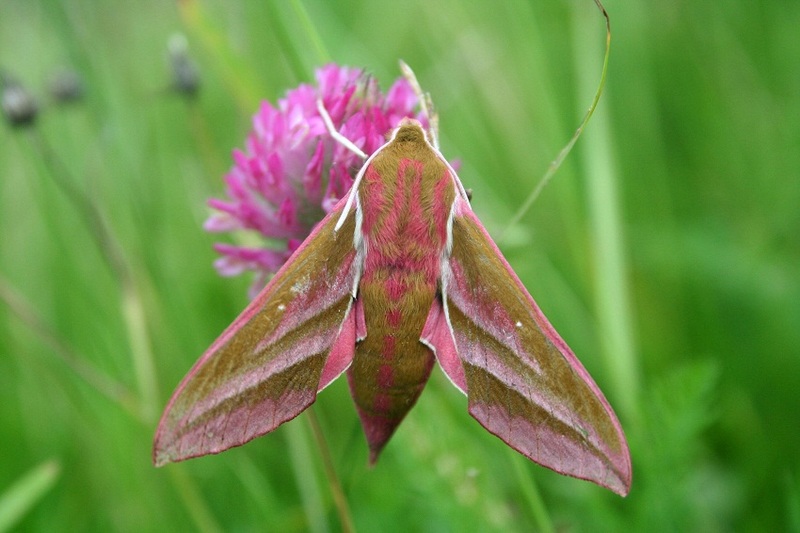 Elephant hawk moths primarily prefer Rosebay Willowherbs, and can be found in a wide variety of habitats where this kind of vegetation is present including waste ground and clearings, hedgerows, rough grassland, woodland, heathland, sand dunes, and even in manmade gardens especially those that have bright, colorful flowers. In the past, two separate subspecies were recognized, viz. Deilephila elpenor elpenor and Deilephila elpenor lewisii, though they are no more considered to be distinguished. The scientists also believe that the Deilephila elpenor szechuana is only a synonym for the D. elpenor. However, the population of Deilephila elpenor macromera, found in northern India, southern China, Myanmar, and Bhutan continues to be a distinct subspecies. The life expectancy of the adult elephant hawk moths is up to 5 weeks. These creatures lead a solitary life. The peak time for these creatures is between June and September and is rarely seen during winter. Like most other moth species, the adults are nocturnal and often go unnoticed unless they are attracted to bright lights. They begin flying from the dusk and stay active all night, finally coming to rest by sunrise. 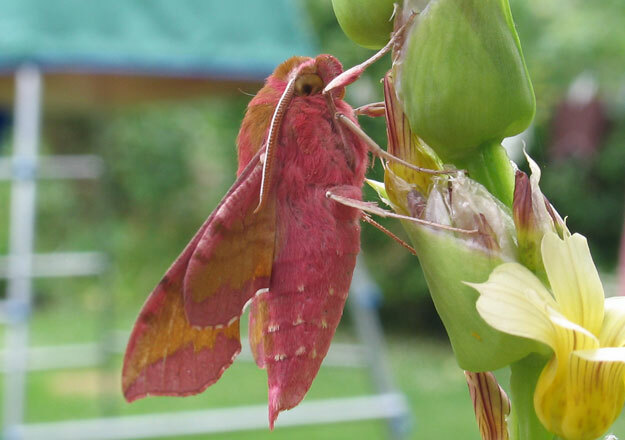 These moths spend the entire daytime on food plants. Unlike the caterpillars, which feed on plant matter including bedstraws, willowherbs, fuchsias, and gooseberry, the moths live only on nectar. Very much like the butterfly, they visit from flower to flower suckling on the nectar at nighttime. They are mostly attracted to flowering plants like honeysuckles. The female elephant hawk moths are relatively less bright. When the breeding season arrives, it gets attracted to the brightly-colored males. After mating, the female would lay eggs either in pairs or singly atop leaves and flowers so that, these plant matters can be a source of food to the young caterpillars. The eggs of these insects are light green with a glossy surface, and take around ten days before hatching. 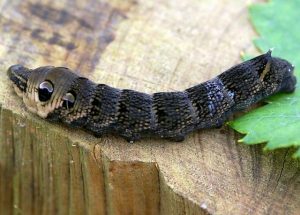 The caterpillars are generally blackish or dark brown in color, but also green at times. 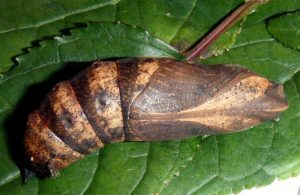 They are found between late summer and early autumn before metamorphosis, after which, they assume the chrysalis (pupa) stage. 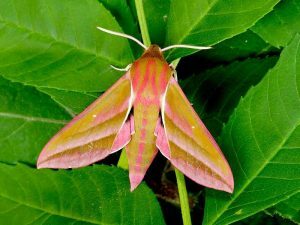 They finally hatch out as brightly-colored moths in around May of the following year. The caterpillars have considerably large eye markings on the forehead to ward off predators. As a defensive mechanism, when the insect is threatened, it withdraws its head inside the thorax, thus swelling it up, resulting in the eyespot mimicry marks being visible more prominently. This, in turn, makes the region resemble a false head, making it look like a snake, which might confuse its predators whether it is dangerous (poisonous) or safe to eat. The two color variations (green and grown) might as well be a defense tactic. If a predator is looking for brown caterpillars, it may overlook the green ones, or vice-versa. Their eyes are incredibly sensitive and allow them to see and differentiate between colors even at low light. This is another mechanism to keep them hidden entirely in the dark. The primary enemies of these moths are spiders, especially the brown huntsman spider that shares its habitat. The moths get lured to the bright white forehead stripes of these creatures in the dark and are soon eaten. 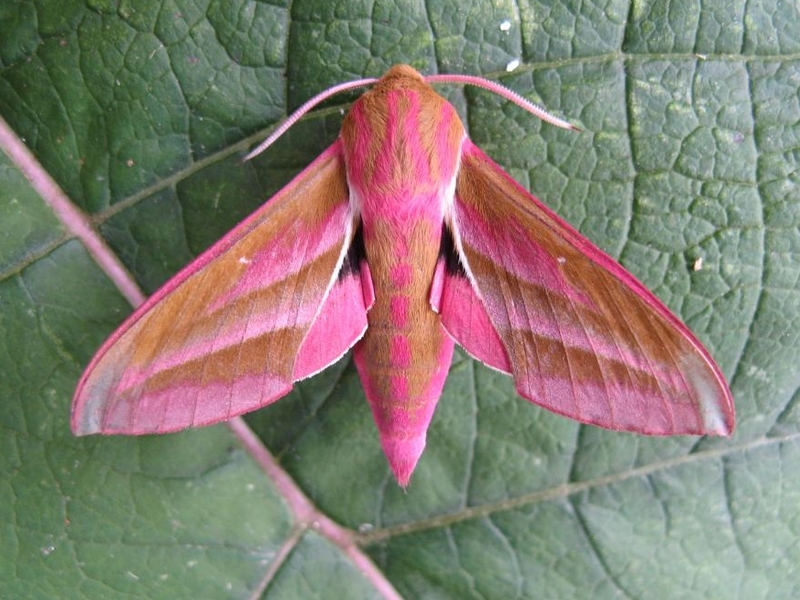 Different species of nocturnal creatures, including owls and bats, also prey upon these moths. This species is common and have not yet been listed on IUCN’s Red List. 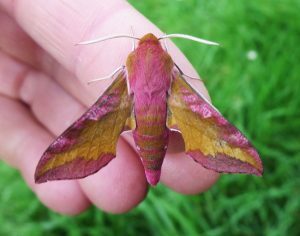 Most people tend to confuse the elephant hawk moth with the ‘small elephant hawk moth’ because of their striking similarities. However, though closely related, they are entirely different species. 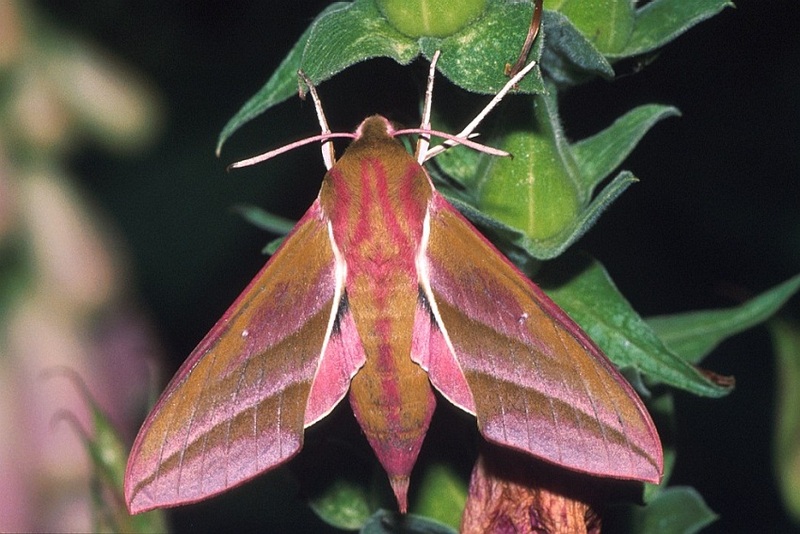 Like the giraffes and the zebras, the color pattern of each moth is different from the other.